“Like Laurel and Hardy, Don Quixote and Sancho Panza, Bouvard and Pecuchet, Rat and Bear!" Stefan Zweifel, Flowers and Questions, 2006. 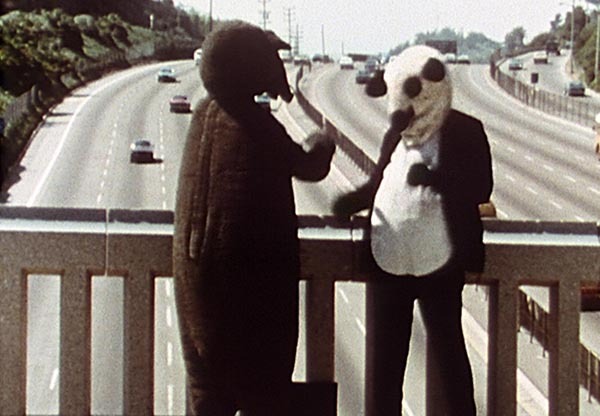 Dressed in rented animal costumes, internationally acclaimed multimedia artists Fischli and Weiss, "the merry pranksters of contemporary art" (The New York Times), take their characters "rat" and "bear" on a string of adventures that pose serious questions about art, crime, nature, and the meaning of life. Their first film, a Chandleresque crime drama, begins with them stumbling upon a corpse in a Los Angeles art gallery. Hoping it will be their key to fame and fortune, they take it with them, only to find their plans spiraling out of control. “The result is more reminiscent of Quentin Tarantino’s Pulp Fiction watched after a dose of psilocybin mushrooms” (Lauren O’Neill Butler, ArtForum). In the sequel, rat and bear’s philosophical debates and fractious relationship are tested against the majestic backdrop of the Swiss Alps, as they find themselves at the mercy of nature, once again grappling to understand the seeming chaos of the world. "In the epic style of an age-old tale, the film traces the path to understanding: the profound, melancholy, but also the comic realization that every "right way" is also a wrong way (and every wrong way also a right way)" (Patrick Frey, Parkett Magazine). Der Geringste Widerstand (Point of Least Resistance | Switzerland 1981. 29 mins. 16mm-film transfer to video. In German with English subtitles. Der Rechte Weg (The Right Way) | Switzerland 1984. 55 mins. 16mm-film transfer to video. In German with English subtitles. Peter Fischli (born 1952) and David Weiss (1946-2012) started working as a creative duo in 1979. Their collaboration included sculpture, photography, drawing, art books, video and multimedia installations, often using everyday objects to convey humor, irony or wonder at the seemingly mundane. They have been the subject of exhibitions and retrospectives at Tate Modern, MoMA, The Guggenheim Museum, and Le Centre Georges Pompidou, and twice represented Switzerland at the Venice Biennale, in 1995 and in 2003, winning on the second occasion the Golden Lion.